How To Prepare Economy for Civil Services Exam? If aspirants preparing for UPSC Civil Services Exam are confused about one particular subject, that is Indian Economy! 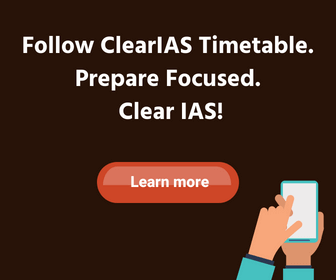 Candidates are doubtful about the approach and study-materials for Economics section of IAS Prelims and Mains. They keep on asking about the single, all-in-one-book to cover Economics. Textbooks do exist, but unfortunately, as Economy section for UPSC exam is more current affairs based, no one can guarantee any text book as complete. Ideally, one should have atleast one book on Indian Economy plus the latest economic survey. Also, the latest budget should be properly analysed. Economic and Political Weekly (EPW) is a magazine which can be suggested as a good read. The best way to start is by understanding basic concepts, thinking and asking questions. We hope ClearIAS Economics Concepts (free) would be a good starting point. Indian Economy – Ramesh Singh. Indian Economy Since Independence – Uma Kapila. Indian Economy – Datt and Sundaram. Indian Economy – Sanjeev Varma. Indian Economy – Mishra and Puri. Indian Economy – Performance and Policies – Uma Kapila. 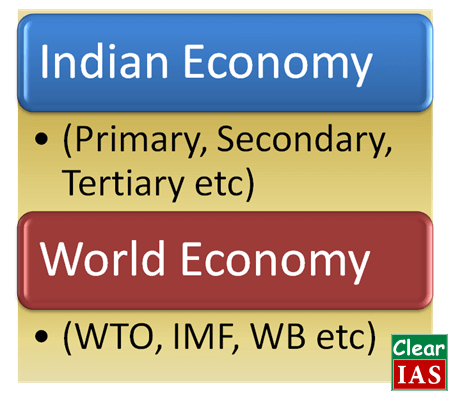 Economics preparation for UPSC can be divided into 2 steps. As it is clear from above, the first part is building the conceptual knowledge. If you are clear with the conceptual part, learning economics will be always fun. Then there won’t be any further mugging up, but only co-relating what you have already studied in day to day scenarios. Hence it is very crucial not to get confused at the beginning stage. Economics notes which you shouldn’t miss! Question : If rate of Inflation is high, what will be the step taken by RBI? Option E : None of the above. As it is clear, only a person with clear understanding of economic concepts would be able to answer these type of questions. Mere mugging up won’t help in this area. But at the same time, it is also important to note that to successfully write Indian economy related questions for Prelims and Mains (GS), there is no need to prepare as if you need to take Phd. in economics. What you need to understand are the problems and solutions pertaining to Indian Economy. And in that sense, you should be more focused about newspaper economics than text book economics. More than any books, economy section of standard English newspaper (The Hindu) will be most useful in this stage. Books and magazines which can complement the economy preparation in Stage 2 is listed below. Economic and Political Weekly (EPW). Indian Economy for Prelims and Mains needs different approaches. Mains syllabus specifically mentions about some aspects of Indian Economy like issues relating to planning, mobilization of resources, growth, development and employment, Government Budgeting, cropping patterns, Public Distribution System, Technology missions, Food processing, Land reforms, Liberalization, Infrastructure and Investment models. If we examine the questions related to Indian Economy section for Prelims and Mains, the pattern and nature of questions will become more clear. Conceptual understanding of economics and Indian Economy is a must for answering most of the questions. Ability to apply the economic concept in current economic scenarios is also needed. Thanks ClearIAS !!! it is comprehensive and easy to understand keep up!!! Sir,i I am the student of graduation final year and I also an IAS aspirant so plz guide me that how I prepare for it to get success with doing best of my own talency.. This Channel is started by CA Dhananjay Ojha. Main motive of this channel is to make integrated preparation for UPSC prelims 2018 (MCQ-Indian Economy) and preparation for General studies Paper 3-( answer writing) . It is really helpful for UPSC aspirant. This Channel is started by CA Dhananjay Ojha. Main motive of this channel is to make integrated preparation for UPSC prelims 2018 (MCQ-Indian Economy. )and preparation for General studies Paper 3-( answer writing) . I am studying in first-year and my aim is to qualify IAS in first attempt but I am thinking of doing IAS in economics would it be tough than doing in pol.science or history .